The Reinhold-Brown Gallery specializes in rare original posters and graphic design from the Vienna Secession, Art Nouveau, Art Deco, early avant-garde, Russian Constructivist, Fluxus, and Pop Art Movements. 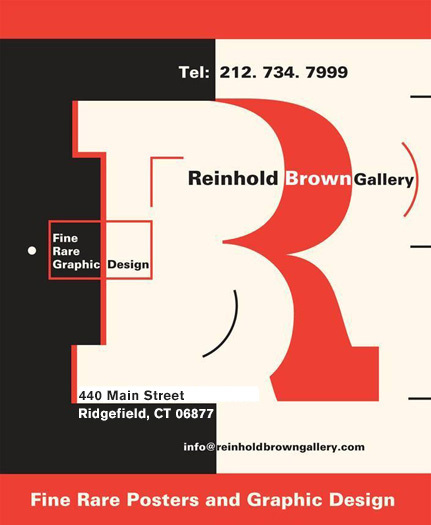 Since its founding in 1973, the Reinhold-Brown Gallery has been regarded among critics, curators, art and design collectors and scholars as the most important international resource for rare original posters and graphic design material. Its owners Susan Reinhold and Robert Brown have contributed to many books, exhibition catalogues and journals in their field; consulted for museum and private collections; and have held pioneering exhibitions dedicated to various movements, artists and designers such as Posters of the Vienna Secession, The Dada Poster, Russian Constructivist Posters, The German Advertising Revolution of the Early 20th Century, Experimental Typography, Photomontage Posters, Frank Lloyd Wright: His Graphic Art and Its Influence, Bauhaus Posters, Architecture and the Poster, The Modern Japanese Poster, Fluxus and Pop Art Posters, The Poster Art of A.M. Cassandre, Ludwig Hohlwein Posters, The Graphic Design of Lester Beall, Paul Rand: A Retrospective, and Documenting Duchamp: A Commemoration of Landmark Duchamp Exhibitions. The gallery also exhibits and offers artists books and multiples including the S.M.S. portfolios, Artifacts at the End of a Decade, Portfluxus and works by George Maciunas, George Brecht, Ray Johnson, and Dieter Rot among others. Copyright © 2012-2016 Reinhold-Brown Gallery. All Rights Reserved.